The legal address, facilities, and physical location are not required on the proposal, but I feel the need to explain my thoughts on this to everyone. I believe that the school being built these days are an enormous waste of money. Educating children is a very simple process that doesn’t require vaulted ceilings, gymnasiums, golf course like landscaping, and enormous windowed entrances. All of these things are enjoyed by the students and parents and they help the process, but they are not required. Below you will find the list of building related services and resources from our budget. Separate classroom for each teacher. Common meeting area that can accommodate all of the students and teachers. When I think of our location and building I think of a logging camp or a mill town where they need to temporarily house a large number of people. They bring in a cat level the ground, dump a bunch of gravel and move in pre-fabricated buildings. This allows flexibility if they need to move and doesn’t tie them to a location. I think we should take this same approach when building our school. Another advantage is cost. 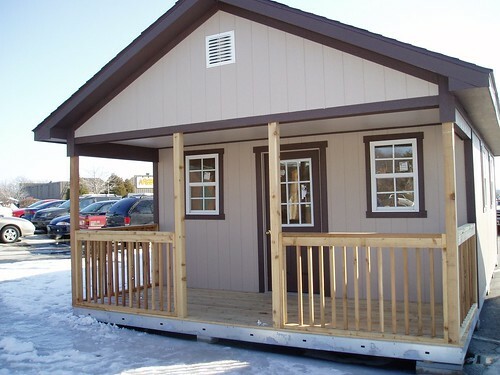 Pre-fabricated portable structures are much cheaper than building permanent stick built structures. It also allows us room for growth and expansion. If we build or occupy a permanent structure and we need to expand we’ll be forced to move or remodel. Both of these things are very time consuming and expensive. With pre-fabricated portable structures we can just move another one on site. Tuff Shed makes a portable structure that will be ideal for us. They cost $9,199 and are 16′ X 24′. This price is for a building with no electrical and bar studs. They build them in Hillsboro and haul them down on a trailer to your site. More information can be found on their web site. Here’s a picture of the 16′ X 24′ model. Pour a concrete pad or lay a cinder block foundation. Wire the building and hook up the power. Insulate and sheet rock the interior. I don’t think it is necessary to pipe water to each individual building. If students are thirsty or have to go to the bathroom they can visit the shared bathroom facility. Romtec is a pre-engineered public restroom manufacturer based out of Roseburg. They sell a Multi-User model for $35,000. The install on this would be more expensive than the classrooms because it would require sewer hookup and or septic tank installation. This brings us to our common meeting area. This structure will need to accommodate 100 people at one time and serve as our indoor recess and lunch room. My initial estimate is the building should be 70′ X 50′ with 16′ ceilings. This is equivalent to half the size of a high school basketball court with 10′ surrounding the outside of the court. It would be a 3,500 square foot building. I’m confident that you could get a building this size built for $150,000. Rules governing the budgeting and accounting systems for schools and the school systems of accounts are contained in Chapter 2 of the Program Budgeting and Accounting Manual, published by the Oregon Department of Education. The State Board of Education adopts this publication to govern budgeting and accounting systems for schools. I’m going to continue investigating and learning more about OAR 581-023-0035, but for now I’m going to say that our system will adhere to all of the requirements set forth by ORS 327.511. I’m continuing to work on our proposal. This morning I completed the Expected results of the curriculum and the verified methods of measuring and reporting objective results section. I’ve received information from the TSPC (Teacher Standards and Practices Commission) about credentials and licenses for our Administrator. Question: If our charter school is going to employ a non licensed administrator and this person is already licensed with the TSPC as a teacher does this license fulfill the requirement set forth by ORS 338.135? Or do they need to fill out a separate Form C-1 and check the Charter School Registration: Administrator ? Answer: A teaching license or registration will not be acceptable. The administrator must hold an Oregon administrator license or a Charter School Registration for school administration. Question: If we want to employ an administrator that is not licensed, does the administrator need to meet HQ requirements? Or do we just need to make sure they are registered with the TSPC by filling out Form C-1 and checking the Charter School Registration: Administrator ? A letter from the Charter School Administrator requesting a registration for a teaching position OR a letter from the Chair of the Board requesting registration for an administrator position. The letter should include a specific description of the position to be held by the registrant. We now know that we can employ an administrator that does not hold an Oregon administrator license as long as we follow the steps listed above to get them Charter School Registered for School Administration. I’ve received a copy of the Proposal and Contract from Sauvie Island Academy.